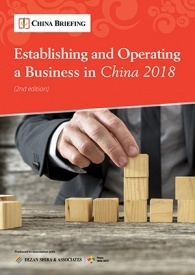 To gain a foothold in the Chinese market, franchisors are advised to familiarize themselves with the country’s regulatory structure and consumer market preferences. In this article, we explain China’s franchise market and highlight necessary legal precautions for foreign companies seeking a presence in this market. Franchising in China has undergone rapid development over the last decade. In 2015, total sales of the top 100 franchisors in China reached a record high of RMB 434.5 billion (US$62.9 billion) before declining to RMB 330 billion (US$47.8 billion) in 2017, according to the China Chain Store & Franchise Association (CCFA). 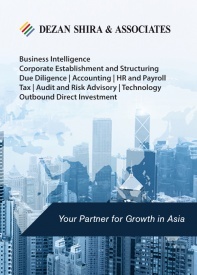 As of January 2019, 4,368 franchisors have registered with the Ministry of Commerce (MOFCOM), while unofficial statistics indicate that China already has over 4,500 franchises and chains with some 400,000 outlets in operation, making China one of the largest franchise markets in the world. Among these franchises, many are domestic brands and small in scale, with an average of around 90 outlets per franchise system, compared to an average of several hundreds of outlets per franchise system in countries like the US and UK. Key industries and sectors in the franchise market include food and beverage (F&B), retail, car rental, catering, education, beauty, health and fitness, and hospitality. Despite the slowdown in economic growth, China will remain one of the world’s fastest-growing consumer markets for the foreseeable future. 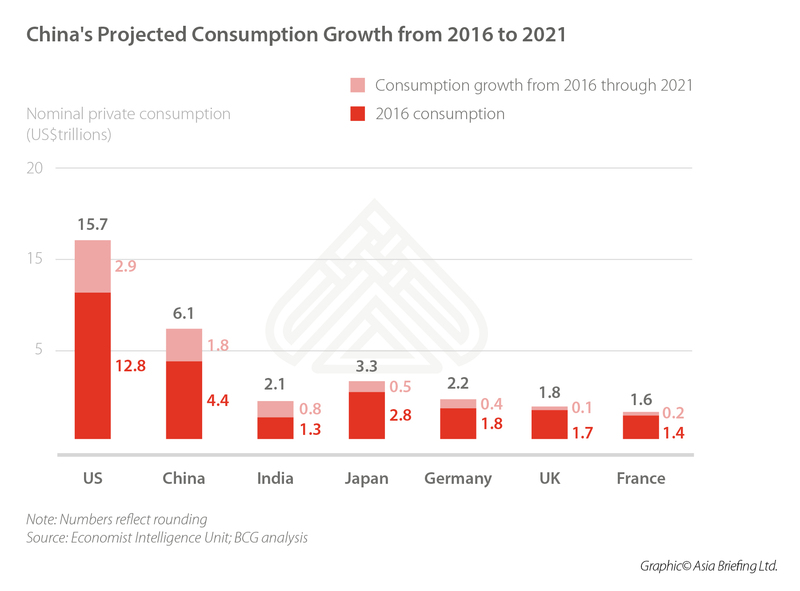 Even if China’s overall GDP grows at less than seven percent a year, its consumption is projected to increase by more than 10 percent annually. This is mainly because the country’s structural reforms aim to transform China into a consumption-driven economy. In the first three quarters of 2018, China’s consumption expenditure accounted for 78 percent of its economic growth, according to the National Bureau of Statistics. A survey jointly published by Boston Consulting Group (BCG) and Alibaba estimates that even if we conservatively assume that the yearly growth of China’s GDP was only 5.5 percent (it was 6.6 percent in 2018) from 2016 to 2021, China’s consumer market could still reach US$6.1 trillion by 2021. Investors will find ample opportunities in the Chinese market – foreign brands enjoy positive perceptions among Chinese consumers and the government has expedited the process to establish foreign-invested entities (FIEs) since October 2016. However, the increased opportunities come with new challenges. 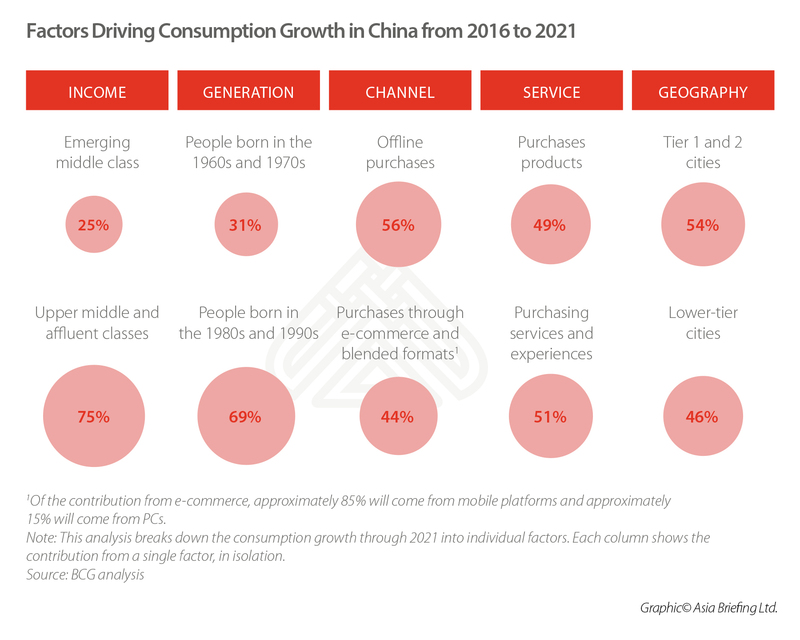 Higher incomes, a younger generation of consumers, and e-commerce not only boost China’s consumption, but also contribute to a far more heterogeneous consumer market. Upper middle class and affluent households are trading up – buying higher-quality services in discretionary categories like travel and entertainment. Discerning and trend-conscious millennial shoppers – the new consumption power – are showing diverse and fast-changing preferences for characteristic or customized products and services. Chinese consumers show high preference for integrated digital shopping experiences due to the rise of online shopping and broader access to technology. These trends and consumer preferences are influencing major industries in the franchise market. Online restaurant delivery platforms, e-commerce grocery sales, and restaurant chains in third-and fourth-tier cities are developing rapidly in F&B industry. Digitalization driven by smartphone penetration, popularity of mobile commerce, and big data analysis is creating new marketing tools, sales channels, and improving the interaction between merchants and consumers in the retail industry. New market segments are evolving in the services industry, such as healthy and fashionable lifestyle services, to cater to the tastes of younger consumers. Global franchisors should be alert to these challenges, trends, and changes when strategizing their entry into the Chinese market, which is large but also highly dynamic and differentiated. Foreign companies enter the Chinese market through various ways, such as foreign direct investment (FDI), exporting, global sourcing, franchising, and licensing. Franchising allows the franchisor to grant franchisees the right to use its business model, brand, know-how, intellectual property (IP), etc. to sell its branded products and services in exchange for fees, royalties, or other compensation. It has both advantages and disadvantages when compared to other business models. On one hand, franchising enables franchisors to invest less money, to leverage franchisees’ local knowledge, and to internationalize quickly to many markets. KFC and McDonald’s entered China in 1980 and 1990 and neither of them initially franchised their outlets. KFC began granting franchises in lower-tier cities in 1992 and now have around 6,000 outlets in mainland China, more than twice the number of McDonalds’ outlets, who adopted franchising later in 2004. Franchising can help brands expand in the local market faster – if they find the right partners. However, a down side is that franchisors can only maintain limited control over franchisees and its assets abroad and may face risks by creating a future competitor. Are you qualified to start a franchise in China? The Commercial Franchise Administration Regulation (2007) lays out the qualifications for potential franchisors. 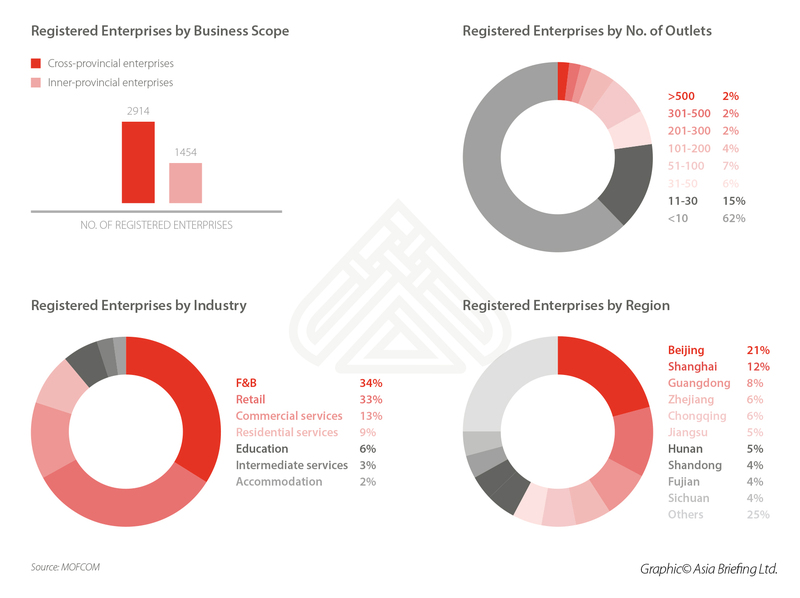 First, only enterprises can engage in business as franchisors. The enterprise should have a mature business model as well as the ability to provide franchisees with long-term business guidance, technical support, and business training. Second, the enterprise should comply with a “2+1” rule, which means that it must operate at least two direct-owned outlets for more than one year in any part of the world – a local entity is not necessary. Third, franchises in China are subject to national network-based record filing. This requires the franchisor to file their records with the relevant commercial authorities within 15 days after initially signing a franchise contract with the franchisee. Establishing a local entity, usually in the form of a wholly foreign-owned enterprise (WFOE) or a joint venture (JV) to grant concession to other Chinese enterprises. China adopted its first franchise law in 1997, but foreign franchising remained mostly a gray area at that time until a new law was announced in 2005, which eliminated legal restrictions on foreign investment in franchising. Now, China’s franchise law is clearer by virtue of the 2007 law, a revision of the 2005 law. The Administrative Measures for Foreign Investment in Commercial Fields (外商投资商业领域管理办法, 2004). Other laws that may affect franchisors include: the Labor Contract Law (劳动合同法), the Anti-unfair Competition Law (反不正当竞争法), the Anti-monopoly Law (中华人民共和国反垄断法), the Trademark Law (商标法), and the Copyright Law (著作权法). As mentioned above, franchisors need to file with commercial authorities within 15 days from the date of the execution of the initial contract with the franchisee. For the filing authorities, if the franchisor is registered within Chinese territory, record filing should be made with the relevant commercial department at the provincial-level government. However, if the franchisor is registered overseas, record filing should be made with the MOFCOM’s head office in Beijing. Other documents and materials as stipulated by the relevant commercial authority of the State Council. If any of the above documents are prepared outside of China, it should be notarized by a notary institution in the country in which it was prepared (with a Chinese translation attached) and be certified by the Chinese embassy or a consulate. In case a franchisor fails to do so, a fine of RMB 10,000 (US$1,500) to 50,000 (US$7,300) may be imposed by the government. If the franchisor fails again to pay the fine within a certain time, it will be fined RMB 50,000 (US$7,300) to 100,000 (US$15,000), and a public announcement will be made. You may download the filing materials from the government website. After submission, the filing authority will handle the filing and make a public announcement on the website of the MOFCOM within 10 days from the date of the receipt. Supplementary documents and materials may be requested within seven days if the submission is incomplete. 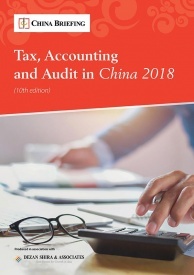 If there is any change in the franchisor’s filing information, in the information on business resources or in the distribution of stores of all franchisees within the territory of China – the franchisor should, within 30 days from the date of the change, apply to the filing authority for a change. Moreover, the franchisor should, before March 31 in each subsequent year, report to the filing authority the conclusion, cancellation, termination, and renewal of the franchise contract in the previous year. According to the Administrative Measures for Commercial Franchise Information Disclosure (2012 Revision), a franchisor has an extensive information disclosure obligation towards a prospective franchisee. Any other information prescribed by the commercial administrative department. Failure to disclose such information may incur a fine of up to RMB 50,000 (US$7,300). Further, if the franchisor conceals information or provides inaccurate information that affects the performance of the franchise, the franchisee may have legal grounds to terminate the agreement. The franchise contract forms the heart of a franchise and provides the basis of the cooperation between the franchisor and the franchisee. As stipulated by current regulations, a written contract should be signed by both sides and the term of the franchise stated in the franchise contract should not be less than three years unless the franchisee agrees to a shorter term. Other matters as agreed upon by the franchisor and the franchisee. Further, franchise agreements must contain a cooling-off period in which the franchisee may unilaterally terminate the agreement to avoid risks such as being inexperienced or acting on impulse. The length of the cooling-off period is negotiated by the parties in good faith. 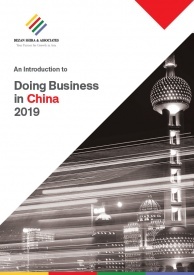 Most franchising activities are not restricted in China, but certain industries are closed to foreign investment: banking, telecommunications, and compulsory school education, among others. Make sure the business scope is not targeting an industry that is in the government’s Negative List. Background investigation on prospective franchisees is essential. Usually, information about a corporation can be found online in major urban areas, including the companies’ shareholders, registered capital, management, affiliates, and past litigation. In addition, proper research and understanding of the different customs and cultures between different regions and ethnic groups in China is also crucial for certain business, like fast food and catering – for them to successfully adapt to local markets and maintain competitiveness. It is to be noted that franchising is a common source of IP infringements. Before entering the Chinese market, franchisors must ensure that their IP is established under Chinese laws and that the franchise agreement contains clear clauses on how their brand name, designs, and trade secrets such as production techniques should be applied. Breach of these clauses should be punishable by penalties and the immediate termination of the franchise by the franchisor. Trademark infringement happens a lot in China. It is critical not to forget to register the trademark under the Chinese law. The Starbucks trademark infringement case is a precedent – a local coffee store chain violated Starbucks’ trademark by nearly duplicating its name and logo. Since Starbucks only registered its trademark in Taiwan instead of mainland China, it cost time for Starbucks to win this lawsuit. You can always register your trademarks in China before you start to establish your business here. However, it is common for local companies to register your logo and brand name in Chinese before you do. Foreign cosmetic brands like Hera, Coppertone, KIEHL’s have all suffered from this. Be careful to protect your brand when disclosing information to franchisees. Sign the confidentiality agreements, through which the confidentiality obligation and responsibility should be clearly stipulated in written form.